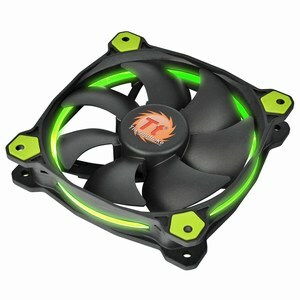 Riing 14 LED Green - Thermaltake has released the new Riing 14 LED Series, a 140mm fan fitted to enhance static pressure that produces impressive cooling performance with an optimized fan blade. Hydraulic bearings for silent operation guarantee ultra-low noise. In addition, an anti-vibration mounting system strengthens the stability during operation. The patented LED Ring maintains color and brightness uniformity. The four-colored LED ring (in blue, red, white, and green) adds style to the chassis.